Survival bread, hardtack, pilot bread, ship biscuit or sea bread, is an inexpensive non-perishable food that keeps almost indefinitely. It has been used throughout history during wars, long sea voyages and in other survival situations, to feed many people with very few ingredients. Survival bread is still baked and eaten today by survivalists, hikers, and campers. Really anyone who needs a long-lasting food source that doesn’t require refrigeration. 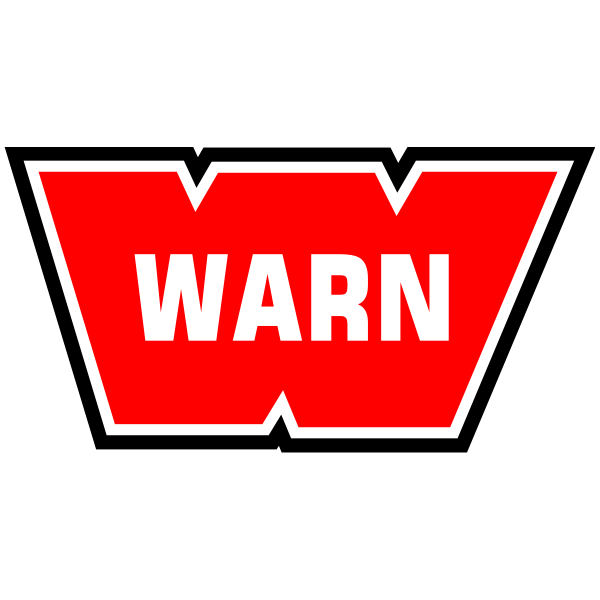 Throw this in a zip lock bag and eat it when you need it. If you are a Lord of the Rings fan you can equate this to a real life version of the elven bread Sam-Wise and Frodo are given. Add flour and a generous pinch of salt to a mixing bowl; you need 4 cups of flour to make 2 pounds of survival bread. Mix the salt and flour together with a spoon. 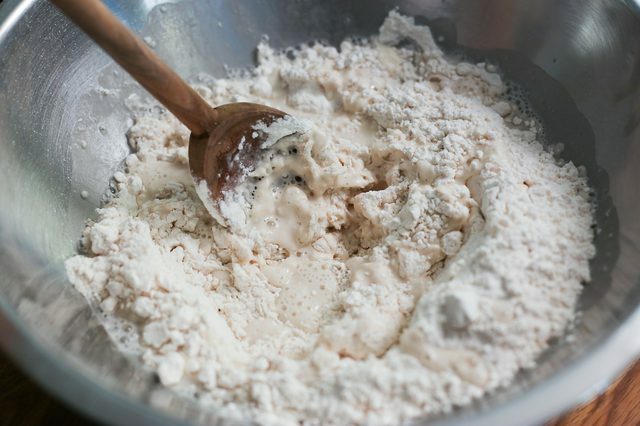 Add water to the flour and salt mixture while you mix it by hand. Only add a little at a time. The mixture should stick together but not to your hands or the rolling pin. You want to use as little water as possible to get it to this consistency. Whatever water you add will need to be dried out and too much can cause the final product to be too hard. Roll out the dough with the rolling pin, shaping it into a large rectangle, until it’s about 1/2 inch thick. 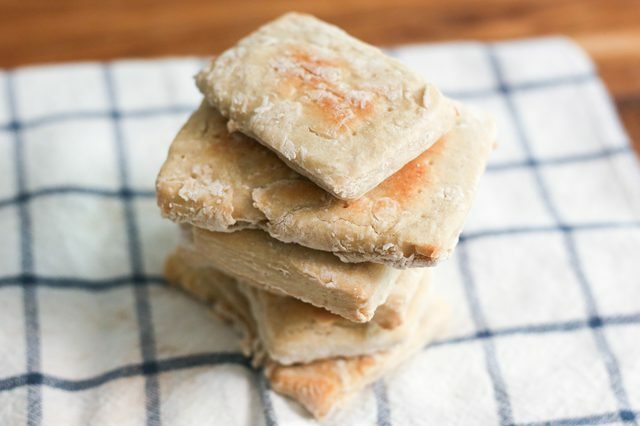 Cut the dough with the knife, creating 3-by-3-inch squares. 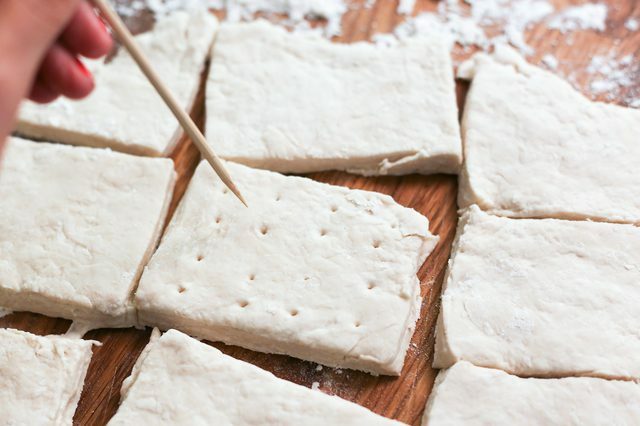 Poke each square with a wooden skewer without punching completely through the dough, making a 4-by-4 pattern of holes. Repeat this hole pattern on the other side as well. The holes will enable you to break the bread easier once it’s cooked. 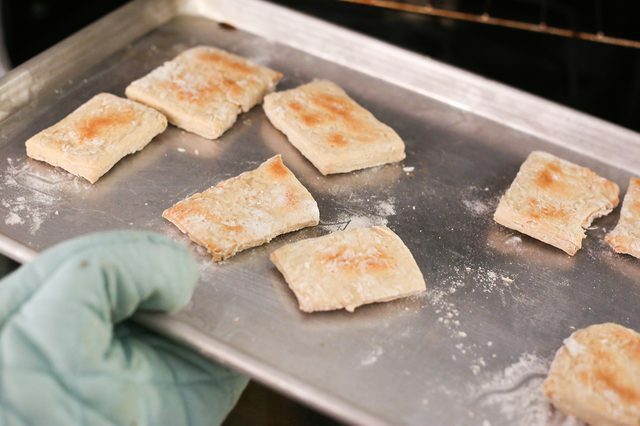 Put the bread dough on a dry cookie sheet and place it in the oven. Bake the dough until lightly browned on the edges, about 20 to 25 minutes. Wait until the bread is completely dry before removing it from the oven. Store the survival bread in a closed container away from moisture. ← SyFy – Blood Drive WTF?